"Moment #31" and "Moment #32" Lorenzi Vineyard oak wine barrels are complete! 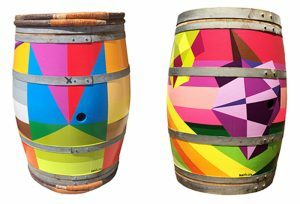 The two commissioned barrels for the collection of Bryant and Jenny Katzen of Temecula, California are now complete. Here are two views of “Moment #31” and “Moment #32″. Montana Gold Spray Paint on Lorenzi Vineyard oak wine barrel 36″ x 28”. See revolving views of the two custom painted barrels in “Gallery 2016”.